These Terms and Conditions are applicable to the use of this website, regardless of how you accessed it. Your use of this website, with or without a username and password, constitutes your acknowledgement that you have read and understand these Terms and Conditions, constitutes your agreement to be bound by these Terms and Conditions, and constitutes your acceptance of these Terms and Conditions, including any changes or modifications made at a later date. Updated versions of these Terms and Conditions will supersede any prior versions. If you do not wish to be bound by these Terms and Conditions, do not continue to use or access this website. Information, text, graphics, software, and other content that make up this website reside on a computer operated by National American Insurance Company or its representative, and this website is based in Oklahoma. Anyone accessing this Website consents to monitoring of this access and use by system or security personnel. Certain areas and content of this website are accessible only through the use of username and passwords. If you have been assigned a username and password, you are responsible for using the content and materials accessible in such restricted-access areas in compliance with your Agency Agreement and these Terms and Conditions. You are further responsible for maintaining the security and confidentiality of the information and documents obtained through access to the restricted areas. You are the only person who may use the username or password assigned to you and you are responsible for all activities undertaken under your username and password. Coverage may not be bound through this website. Insurance products described on this website are provided solely for general informational purposes. The information and descriptions contained herein are not intended to be complete descriptions of all terms, conditions and exclusions applicable to the products and services of National American Insurance Company. The precise coverage afforded and premiums charged are subject to the terms, conditions and exclusions in the policies as issued. Coverage is not bound until receipt of appropriate premium payments. Any quote provided or self-rate indicator is subject to underwriting review. Products and services may vary from state to state and may not be available in all states. National American Insurance Company or its licensor owns the copyright in all of the content comprising this Web site, unless otherwise indicated. By accessing and using this Web site, you agree to abide by U.S. and international copyright law and all other applicable laws. Permission may be needed to use other content not marked with National American Insurance Company’s or any copyright notice. Access to forms, materials and other resources is for the benefit of those users who have entered into an Agency Agreement with National American Insurance Company and who have been given usernames and passwords. All forms, materials and other resources furnished on this website remain the property of National American Insurance Company or its licensor. You shall not use any forms, materials or other resources, except as authorized by the Agency Agreement, and you shall return all unused forms, materials and other resources to National American Insurance Company immediately upon National American Insurance Company’s request. Reference to or use of a product, service, or process does not imply recommendation, approval, affiliation, or sponsorship of that product, service, or process by National American Insurance Company. Nothing contained in this Agreement shall be construed as conferring by implication, estoppel, or otherwise any license or right under any patent, copyright, trademark, or other intellectual property right of National American Insurance Company or any third party, except as expressly granted in this Agreement. Unregistered users are authorized only to view the website and any accessible documents on this Web site. Registered users who have been assigned a username and password are further authorized to use forms, materials and other resources on this website, as authorized in the user’s Agency Agreement and in these Terms and Conditions. The Content included in this Web site has been compiled from a variety of sources and is subject to change without notice as are any products, programs, offerings, or technical information described in this Web site. National American Insurance Company makes no representation or warranty whatsoever regarding the completeness, quality, or adequacy of the Web site or Content, or the suitability, functionality, or operation of this Web site or its Content. By using this Web site, you assume the risk that the Content on this Web site may be inaccurate, incomplete, offensive, or may not meet your needs and requirements. National American Insurance Company SPECIFICALLY DISCLAIMS ALL WARRANTIES, EXPRESS OR IMPLIED, INCLUDING WITHOUT LIMITATION THE WARRANTIES OF MERCHANTABILITY, FITNESS FOR A PARTICULAR PURPOSE, AND NONINFRINGEMENT WITH RESPECT TO THESE WEB PAGES AND CONTENT. IN NO EVENT WILL National American Insurance Company BE LIABLE FOR ANY SPECIAL, INDIRECT, INCIDENTAL, OR CONSEQUENTIAL DAMAGES EVEN IF National American Insurance Company HAS BEEN ADVISED OF THE POSSIBILITY OF SUCH DAMAGES. Certain links on this Web site lead to resources located on servers that are not maintained by National American Insurance Company or under its control. National American Insurance Company is not responsible for the contents of any such referenced Web sites or for the availability of access to such Web sites. Although the information on this Web site is accessible worldwide, not all products or services discussed in this Web site are available to all persons or in all geographic locations or jurisdictions. 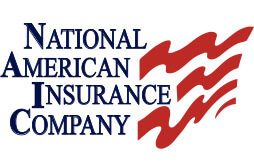 National American Insurance Company reserves the right to limit the provision of their products or services to any person, geographic area, or jurisdiction they so desire and to limit the quantities of any products or services that they provide. Any offer for any product or service made in the materials on this Web site is void where prohibited.